"Now, now listen, listen everyone. The Cybermen are here, in this Wheel!" 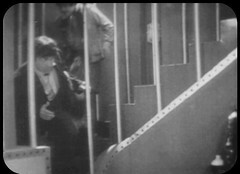 This is a bit more like it, the Cybermen are finally on the station and up to something, even if they don't appear that much and their crucial final shot is missing from the telesnaps - I had to borrow a frame from episode five to represent it above! But I think the damage has already been done by those first few episodes. I'm finding it difficult to care for the majority of the base crew at all. There's a few too many of them for a start. CORWYN: I don't know yet. ZOE: Well, if he is he's chosen a rather inconvenient time, hasn't he? CORWYN: Do you ever feel anything emotional, Zoe? ZOE: Emotional? Do you know, that's the second time I've been asked that in the last few hours. Leo Ryan said that I was all brains and no heart. CORWYN: Yes, it's your training. I shouldn't worry about it. ZOE: Oh, but I do. I don't want to be thought of as a freak. Leo said I was like a robot, a machine. I think he's right. My head's been pumped full of facts and figures which I reel out automatically when needed, but, well, I want to feel things as well. CORWYN: Good. Unfortunately the parapsychology unit at the City tends to ignore this aspect in its pupils. Some of them never fully develop their human emotions. ZOE: You don't think I'll be like that, do you? CORWYN: No. No, you seemed to have survived their brain-washing techniques remarkably well. Once again Zoe's lack of emotions gets a reference and we find out that this is due to her upbringing and schooling. 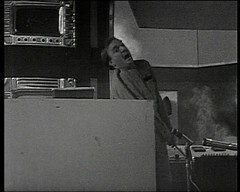 BENNETT: Well, what are these Cybermen then? DOCTOR: They were once men, human beings like yourself, from the planet Mondas, but now they're more robot then man. BENNETT: You mean half and half? DOCTOR: Oh no, more than that. Their entire bodies are mechanical and their brains have been treated neuro-surgically to remove all human emotions, all sense of pain. They're ruthless, inhuman killers! BENNETT: You really expect me to believe that rubbish! DOCTOR: It's not rubbish! They'll kill anyone who stands in their path. You've got to believe me. You've just got to! The two Cybermen in this story have some Doctor Who connections: Jerry Holmes had an uncredited role as a Parisian man in The Massacre of St Bartholomew's Eve. 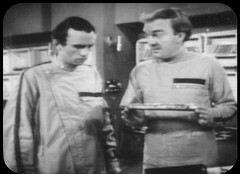 Gordon Stothardis a regular extra at the time having already played a Robot Yeti in The Web of Fear, he'll be back in The Invasion and Mind of Evil. His Invasion appearance catches the eye of Toby Hadoke in "Running Down Corridors". He appears without disguise there and is seemingly the same actor that played Grun, the King's Champion, in The Curse of Peladon. That role is credited to Gordon St. Clair who has no other credits elsewhere and was never traced. If it's another actor appearing under a different name then that would explain it! 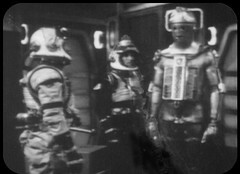 Peter Hawkins and Roy Skelton provide the Cyberman voices. 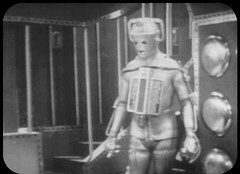 Hawkins fulfilled the same role on all three of the Cybermen's appearances so far. Skelton worked on the first, the Tenth Planet, and we last heard him voicing the computer in the Ice Warriors. 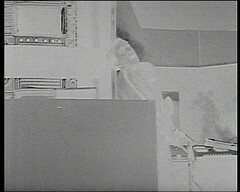 The second death, a typically Doctor Who negative effect over the demise of Australian Bill Duggan's, survives courtesy of the Australian Censor and can be seen on the Doctor Who - Lost In Time DVD.